easier. In temperate climates there is a sudden movement of sap at the end of the winter as trees prepare to burst into growth. In North America, the sap of the sugar maple (Acer saccharum) is most often used in the production of a sweet liquid, maple syrup. 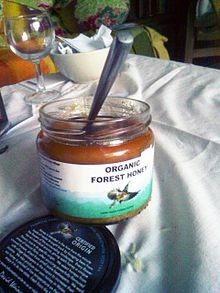 About 90% of the sap is water, the remaining 10% being a mixture of various sugars and certain minerals. The sap is harvested by drilling holes in the trunks of the trees and collecting the liquid that flows out of the inserted spigots. It is piped to a sugarhouse where it is heated to concentrate it and improve its flavour. One litre of maple syrup is obtained from every forty litres of sap and has a sugar content of exactly 66%. A similar process happens in northern Europe when the spring rise in the sap of the silver birch (Betula pendula) is tapped and collected. This is either drunk fresh or is fermented into an alcoholic drink. In Alaska, the sap of the sweet birch (Betula lenta) is similarly collected and converted into birch syrup with a sugar content of 67%. Sweet birch sap is more dilute than maple sap and one hundred litres are required to make one litre of birch syrup. Various parts of trees are used as spices. These include cinnamon, made from the bark of the cinnamon tree (Cinnamomum zeylanicum) and all spice, the dried small fruits of the pimento tree (Pimenta dioica). Nutmeg is a seed found in the fleshy fruit of the nutmeg tree (Myristica fragrans) and cloves are the unopened flower buds of the clove tree (Syzygium aromaticum). Sassafras oil is an important flavouring obtained from distilling bark from the roots of (Sassafras albidum).